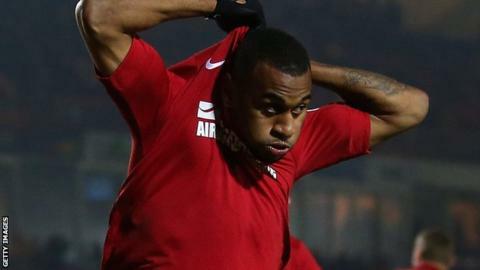 Danny Haynes' goal helped the Robins close to within a point of safety with three games to play. Cheltenham Town boosted their League Two survival hopes as they beat Cambridge at Whaddon Road. Shaun Harrad opened the scoring for the hosts when he rifled into the bottom corner from outside the box. Mathieu Manset had an effort ruled out for offside for the U's before Ryan Bird equalised with a near-post header. The Robins sealed the win when Danny Haynes poked in from close range and Matt Sparrow's deflected effort beat Chris Dunn from 12 yards. The result sees Cheltenham close to within a point of safety with three games to play. Match ends, Cheltenham Town 3, Cambridge United 1. Second Half ends, Cheltenham Town 3, Cambridge United 1. Zack Kotwica (Cheltenham Town) wins a free kick on the left wing. Attempt missed. Matt Sparrow (Cheltenham Town) right footed shot from outside the box is close, but misses to the right. Corner, Cheltenham Town. Conceded by Greg Taylor. Corner, Cambridge United. Conceded by Durrell Berry. Attempt missed. Shaun Harrad (Cheltenham Town) right footed shot from outside the box is close, but misses to the right. Substitution, Cambridge United. Gearoid Morrissey replaces Nathaniel Mendez-Laing. Shaun Harrad (Cheltenham Town) is shown the yellow card. Goal! Cheltenham Town 3, Cambridge United 1. Matt Sparrow (Cheltenham Town) right footed shot from the centre of the box to the top right corner. Corner, Cambridge United. Conceded by Matt Taylor. Substitution, Cambridge United. Jordan Slew replaces Tom Elliott. Substitution, Cambridge United. Sullay Kaikai replaces Harrison Dunk. Attempt missed. Danny Haynes (Cheltenham Town) right footed shot from outside the box is close, but misses to the left. Goal! Cheltenham Town 2, Cambridge United 1. Danny Haynes (Cheltenham Town) right footed shot from the right side of the box to the high centre of the goal. Assisted by Matt Sparrow with a cross. Ryan Bird (Cambridge United) wins a free kick in the attacking half. Matt Taylor (Cheltenham Town) wins a free kick in the attacking half. Attempt saved. Shaun Harrad (Cheltenham Town) right footed shot from the left side of the box is saved in the centre of the goal. Attempt missed. Matt Richards (Cheltenham Town) left footed shot from outside the box is close, but misses to the left. Second Half begins Cheltenham Town 1, Cambridge United 1. Substitution, Cheltenham Town. Durrell Berry replaces Lee Vaughan because of an injury. First Half ends, Cheltenham Town 1, Cambridge United 1. Attempt missed. Shaun Harrad (Cheltenham Town) right footed shot from the centre of the box is close, but misses the top right corner following a set piece situation. Mathieu Manset (Cheltenham Town) wins a free kick in the attacking half.